I was working on a layout this weekend and was browsing some images at the Silhouette Store. I found this card in the new designs and couldn't resist making it as an anniversary card for Scott. I promise once I get some more practice with Silhouette Studio I will do a video tutorial or two. The software is easy to use, but there are a lot of buttons and I keep forgetting what each one does. Maybe once Ethan is back in school and the house is settled again I can really sit and write out a few ideas and come up with a tutorial or two. Hope you enjoy your Monday and see you back here tomorrow. A stunning card Christina, happy anniversary to you and your hussband. Sweet Card! Congrats on 15 yrs! Love the card! And, that banner die! I am going to have to get one of those! Very sweet card! Congrats on the 15 year anniversary! Awesome! Congrats on 15 years!!! How do you like the silhouette compared to the cricut? Love your card. Congratulations Christina and Scott! May you have many more wonderful years to come! Is it true that the silhouette cuts more detailed images than the Cricut? If you could only have one, or the other die cutting machine, which one would you choose? Thanks for sharing another beautiful card. Super cute card! I want to also send congrats on 15 year anniversary to you. Congratulations on your 15th Anniversary! Lovely card. I do have a suggestion so that you can write on the inside. ... Cut the same size and pattern that you have now on the inside and pop it to the back of the front. If the pattern is only one sided then cut two more and glue them together (wrong sides) before you pop it. You still of the demension and now you can write on the inside with out it showing through the heart cut outs. Very Beautiful card Christina and congrats on 15 years! Lovely card. Congrats on reaching your 15th anniversary. 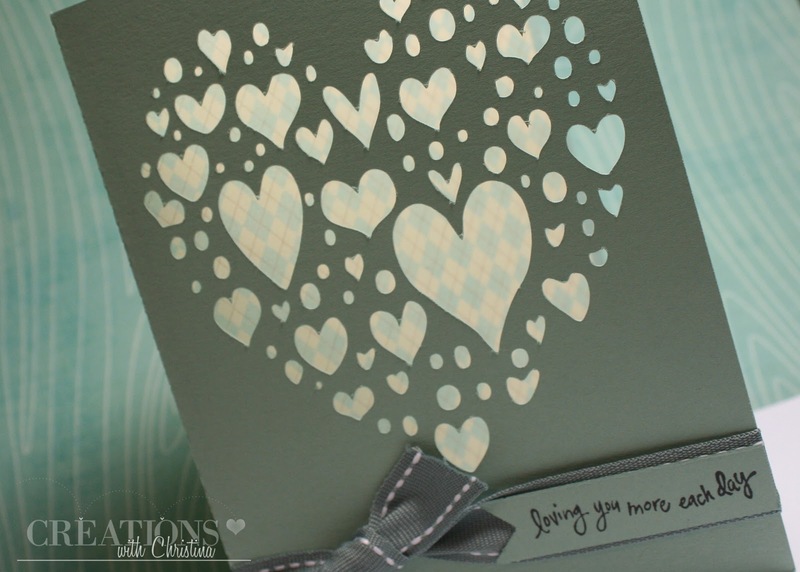 I think the Silhouette goes a great job at intricate cut outs such as the one you used in this card. Love your paper selection. happy anniversary thanks for sharing. This card is adorable! Thanks so much for sharing! Wonderful card. I love that heart with all the hearts. Looking forward to the video on how you did that. Aw this is lovely, the Silhouette cuts so cleanly compared to the Cricut. Happy Anniversary for 2 weeks time. Happy anniversary. Thanks for sharing your card with us. Love the heart cutouts. Makes your card so special. Wishing you and Scott many more anniversaries. My husband and I have had 36 of them. Love your card. Simply but such a big meaning. Happy Anniversary! Happy Anniversary to you and Scott! (We have 37 years tomorrow!) Love the card. Happy Anniversary. Lovely card--love the colors. Silhouette cut-off is really nice. My hubby and I are celebrating our 45th on the 8/26. Can't wait until you do Silhouette videos.